Christmas is once again upon us and the changing of the year is nigh. 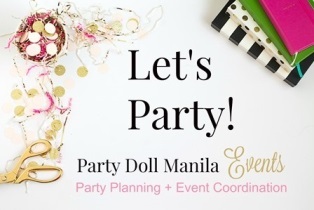 It’s the perfect time to take a look back and be thankful for all the milestones that we at Party Doll Manila has been a part of. We are forever thankful to all the clients who have trusted us with their celebrations. You have proven time and again that each celebration is special on its own. We wouldn’t ever grow tired of seeing the love being shared between families and friends in each occasion. We are also perennially grateful to our website guests and contributors, who share our passion in celebrating life’s special turning points. May you all continue to be our inspiration in featuring memorable, interesting and standout parties. Cheers to more remarkable revelries! And finally, to our Party Doll Manila family: we all deserve a pat on the back. Let’s take this special respite to refuel our passion and face the new year with renewed dedication. Merry Christmas to all, and a Happy ‘Always’!